We had a fantastic time at the London Boat Show. We are now talking with British Marine to see what can be arranged for the Southampton Boat Show. There we have a proper marina with proper boats and real lifting means like halyards and winches but funnily enough Southampton presents more problems than London, where we had to make our own yacht deck and suspend the 8 part tackle from a fixed point in the ceiling, because now we are dealing with live water. But it is not so much the live water, which we can overcome by having a permanent tether on the man and by timing shows to coincide with slack or slacker water, no the problem is that there is no ideal place to site the demonstration. The pontoons have people, the public walking along them the whole time and the show organisers need to be very careful about causing any blockages, such as might occur if a group of people were watching our demo. Worse still, as the director of health and safety pointed out to me, if people are peering down into the water to see the MOB, perhaps craning their necks, perhaps shuffling forward, until like penguins, one plops off the pontoon and into the water. That would not be funny. So the very freedom of the location, causes us problems. We will see what can be done and where. And it may be that demos will be done ashore in a pool, just like in London. If anyone knows the layout of Southampton Boat Show and can think of any way that spectators could be on the shore and we could be demonstrating to them and not to anyone near a pontoon which might cause an obstruction as people stop to look, then do shout out. In the meantime we are offering our MOB retrieval demos to yacht clubs and marinas. Members and berth holders who know how difficult it is to get a man back on board if he can’t help himself can see how, by having a carefully thought out plan and by having the means to retrieve the man from the water already inside his lifejacket with a Lifesaver, it is possible. We will sail Dorothy Lee to the marina or club in question and do the demos from her decks. We have our own p.a. system, so we are a fully self contained presentation unit. 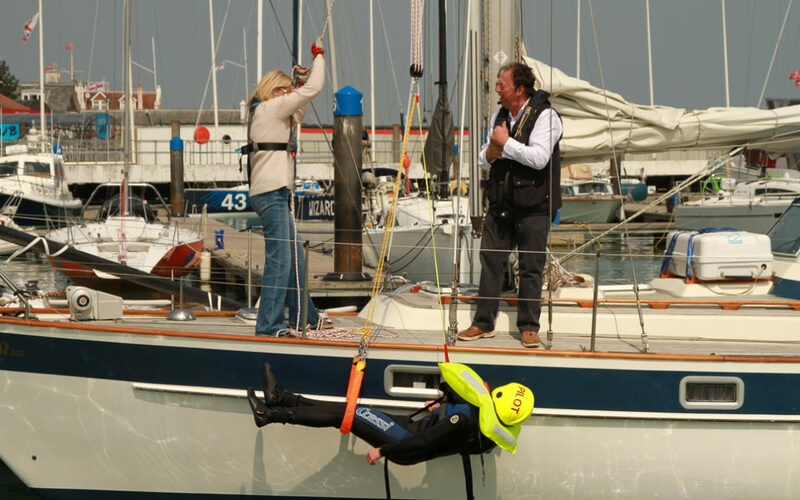 Our man overboard will wear a crash helmet and a wet suit and be tethered to the boat. He will be wearing a Seasafe prozip life jacket with a Lifesaver prefitted. We will of course be using the 8 part Harken tackle, caribiners all the way – never snap shackles – and the strop under the knees to bring the man out horizontally just as we did at London – and then hot tea all round. In terms of getting approvals for the inclusion of Lifesavers in other models of lifejacket we are working with the manufacturers and hope to have some news soon. I also bring Lifesavers and copies of Stress Free Sailing to all the talks.